Use this printer to print wirelessly from a smartphone. There’s no need to switch your laptop on or use cables to print documents. 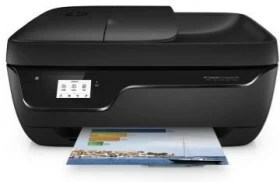 Connect this printer to your wireless network to use it with smartphones, tablets or PCs. Copy, fax, scan or print using your smart device, even if you’re occupied with a meeting. The HP All-in-One Printer Remote mobile app lets you manage your printing and scanning tasks remotely. You can also execute commands via HP’s wireless direct feature. Print photos and documents in high quality. With this printer, HP’s ink cartridges create high-quality prints even if they are priced relatively low. This printer’s 5.5-cm display makes the input of commands a breeze. Use the 35-page automatic document feeder to quickly scan, copy or fax documents with multiple pages. The free HP Printables feature gives you access to a variety of colouring pages, crossword puzzles, coupons, recipes and more.